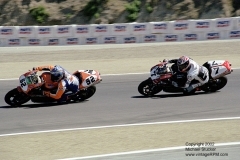 On July 12-14, 2002, the AMA and World Superbikes made their annual visit to Mazda Raceway at Laguna Seca, near Monterrey, California. The photos on these pages were originally intended for Motorsport.com but computer scanner problems prevented that. So now, they reside here on this web site. These photos are all of the World Superbikes on Sunday, July 14. 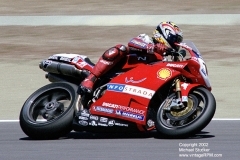 2001 World Superbike Champion Troy Bayliss won Race 1, his 14th win in 17 races to that point in 2002. It was also his last win of 2002. Race 2 was won by Colin Edwards. This was the start of his run of 9 consecutive wins to close out the season and win the 2002 World Superbike Championship.